best vegan cookbooks Vegans Eat What? Kathleen Henry began her vegan journey because of health reasons, most particularly her husband’s rheumatoid arthritis (RA). Being in the medical field, she researched reasons for his debilitating condition. Upon finding that dairy was a huge trigger for his RA, they eliminated dairy, and very shortly afterwards became vegan. Happily, changing their diets has greatly increased their levels of physical health as well as peace of mind. Henry grew up in Palmer, Alaska and now lives with her husband and dog on 7 acres in Wasilla, Alaska, about 50 miles north of Anchorage. You can find her blogs, recipes and more at Produce on Parade. 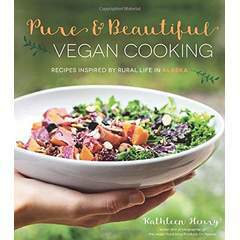 Pure & Beautiful Vegan Cooking: Recipes Inspired by Rural Life in Alaska is an intriguing cookbook. Knowing that Alaska has a very short growing season piqued our curiosity. Learning that the author lives in a very rural area 50 miles from a city, yet eats plant-based, interested us even more. Neither of these facts has squelched her creativity nor her commitment to eating a healthy, plant based diet. Her recipes use easy-to-find whole food ingredients that are combined in unique ways. We especially loved that many of the recipes in her “Morning” section are non-traditional fare for breakfast in the US. The photography in this book is lovely and plentiful, inspiring the reader to try one recipe after another. Below is a recipe that we think will delight and surprise you! In a medium saucepan, bring the water and vegetable broth to a boil over high heat. Stir in the oats and bring back to a boil. Reduce to a simmer and cook, uncovered, for about 30 minutes, stirring occasionally. It should bubble gently during this time and the consistency will end up porridge-like. The oats should be tender but still a bit chewy when done. While the oats cook, bring a small pot of salted water to boil for fava beans. Remove the beans from their large pods and add to the boiling water. Boil for about 5 minutes, then rinse under cold water and simply slip off the whitish bean casing with your fingers to compost along with the pods. Set the beans aside. Steam the diced sweet potato for about 15 minutes, until fork-tender, and set aside. Whisk the nutritional yeast and remaining spices together in a small bowl. When the nuts are done, stir in the spice mixture until well incorporated, then stir in the baby kale. 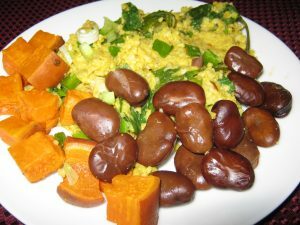 To serve, divide the oats between 2 or 3 bowls and top with the blanched fava beans, steamed sweet potato, green onion and a bit of salsa. Note: Fava beans are a wonderful treat but they do have to be shelled, boiled and then shelled again. If you’re still a bit too sleepy to do all this, feel free to substitute lima beans. They’re available in the freezer section and can be zapped in the microwave or boiled prior to use. Reviewer’s notes: *We easily found canned fava beans. Open the can and rinse; nothing else is needed prior to adding them to the recipe. **Nutritional yeast flakes are easily found in most health food stores and give a “cheesy” flavor to soups and stews.